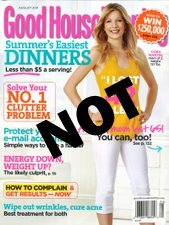 Home » Janie’s Blog » The Good Housekeeping fiasco asks a huge question: when is the media going to catch up with the real world? As informed thyroid patients, we’ve all been talking about it in patient groups, blog posts, and amongst each other. About.com’s Mary Shomon did a good write up in her blog post, and you can see one of several different Facebook group conversations here as well as the article and our comments after it, here. All the above, appearing in what we all thought would be considered a long-standing good magazine, only underscores the irresponsibility and ignorance of the media about REAL LIFE!! Who wants to subscribe to any magazine, or listen in seriousness to any news program, talk show, or internet website that allows this kind of DARK AGES BALONEY on its pages?? I don’t. P.S. One particularly personal tragedy is the author of this article, Susan Carlton. She is clearly hypothyroid, yet completely duped by the pharmaceutically-brainwashed medical field which clings blindly to a poor medication and inadequate labwork. She is ALL OF US LOOKING AT OURSELVES all those years when we believed in the doctors we went to and emptied our pocketbooks to try and find out why we had depression, infertility, rising cholesterol and blood pressure, linger aches and pains, poor stamina and fatigue, weight gain, hair loss, anxiety…and so many more symptoms of undiagnosed or undertreated hypothyroidism. And sadly, how many of us also thought that actions similar to “drinking more java (for energy)”, or “honing crossword skills (for focus)” or attending a “spinning class” (for our weight gain) was going to help us! They didn’t help at all. They just sent us closer to adrenal dysfunction and disability. If you could speak to the author, Susan Carlton, in kindness and wisdom, what would you say to help her get past the brainwashing she is a victim to, as you were?? If you could speak to Good Housekeeping and all media like Oprah, CNN, MSNBC, ABC, FOX, what would you say about the repeated misinformation? You can write to Rosemary Ellis, the GH editor, at rellis@hearst.com, and there are lots of posts at GH’s Facebook page. It is time to fight back against these disinformation campaigns, and I truly believe this article fits that bill. Most magazines are loaded to the overflowing with ads anyways (these days with the newest pharmaceutical panacea).. I think they are a waste of money and this news just clinches the deal for me. Thanks to STTM I finally come empowered with the information I need to my doctors office, and I don’t ask, I tell them what I want & need (we are HIRING THEM after all) based upon my years of research. I also find most female NP’s to be much more compassionate & understanding, then most physicians any day (though there are exceptions). Based upon all the so called “cutting edge” doctors that take no insurance (but secretly subscribe to online resources where sufferers congregate to share what actually does work) and apply it, Id say the truth IS becoming more self evident. Not just because profits are down on Synthroid, but because the average MD is starting to take notice of the # of empowered patients they’re seeing & choosing to treat (right) at long last. Again, thank you Janie and everyone who help get the word out, our numbers are ever growing, and we each need to keep re-educating in thought, word and deed! The article made me feel sad and set back. I have been going in circles with doctors, with them not listening to my symptoms, thinking that my labs are fine, even telling me that I probably have Hashimoto’s Thyroiditis, but that ‘there is no treatment for it’. Meanwhile, my hair continues to fall out, the skin problems, chronic fevers, sinunitis, allergies to foods and medications, fatigue, not sleeping, mood swings, raging, and the depression that is worsened because I cannot tolerate anymore stressors. I don’t leave my house much, and I have a lump in my throat that has yet to be explained to me. When these so-called medical professionals refuse to listen to me, or tell me that ‘I’m so hung-up on this thyroid thing’, it chips away at my resolve. Sometimes I just don’t want to wake up in the morning, or ever again for that matter. Good Housekeeping’s article is dangerous. It made light of something that needs to be seriously looked at. This same magazine would not make light of cancer or any other disease. Educate yourselves. To the author, and to the magazine, you have so much influence. There are so many people suffering. Please help us, because you can. This kind of ‘reporting’ is what killed my mother. Doctors ignored her 100lb weight gain after gastric bypbass, her D&C due to endometriosis, hair loss, major depression, dementia, anger issues, fatigue, insomnia, and cold intolerance. Oh, and then there were the biannual sinus infections, stomach issues and back pain. There was always another reason for her problems. Take this pill. see this doctor. Let’s remove part of your thyroid. Here is some Levothyroixine. Oh, look! Your TSH is ‘normal’.. you are all better now. Until she went into the hospital for a blood clot… oh, did I mention that she was on drugs for osteoporosis? So they treated her for the blood clot…and she felt great for a day or two. Then she died. She bled out. I believe it was an ‘overdose’ of the blood thinner.. why? Because her body did not metabolize it like that of a normal person. Why would I think that? Because MY body does not metabolize drugs like a normal person. So I started researching mom’s issues, and found websites like STTM. I realized that I was going down the same road my mother took… and that I needed to turn around. My mother’s death brought me the knowledge I needed to save my own life, so I can be her for my daughter. NO doctor can tell me that I am ‘misinformed’ because I have researched my own disease. I have seen the effects firsthand and the irresponsiblity shown in this article is not only appalling, it could kill someone. I am very disappointed that Good Housekeeping chose to run this article without checking other sources. I thought I was going crazy when I first had Graves disease. The doctor you mentioned in the story was my doctor for treatment. He was great until he no longer listened to my sysmptoms and concerns. He made it sound like life would be normal once I had RAI. Life has not been the same,it took me a year and 3 doctors to getting close to what I used to be like. Thanks to a good doctor and Nature Thyoid, I can enjoy life again. I still have to becareful to keep things in balance or I don’t feel good. In the beginning of my replacement hormone, I would get lost in an area that I lived in for 10 years, I moved in slow motion, couldn’t think, no energy, hair was falling out, anxiety was though the roof, wanted to sleep all the time, heart palputations, and couldn’t sleep more than four hours. Solution: a sleeping pill–lets cover up the problem. TSH is the worst way to help someone feel good. Once I found a doctor who listened to my symptoms, concerns and treated me like a person NOT a TSH number then I got better. I hope that you start listening to the people who live with hypothyroidism/hyperthyroidism. It is not fun nor is it something you can blow off. Once again, thyroid patients were made to be unimportant as well as getting good treatment. I just don’t understand why the media never takes thyroid problems seriously when it affects so so so many people. This is crazy I’ve worked in the medical field for over 20years as a medical assistant and this is complete bull. TSH is not the only way to check thyroid. You can have a normal TSH and still have thyroid problems. You should do research before you print anything in Good Housekeeping like this. The information in this article is unfortunately extremely ancient and backward. The ranges for “normal” TSH were changed a few years ago to .3-3.5 making a TSH of 10 horribly hypothyroid. The doctor quoted is obviously ignorant of this important change and it’s implication for diagnosing hypothyrodism properly. What is very important in thyroid testing and not mentioned is the amount of FREE T3. This is the active form of thyroid hormone. Normal amounts of T4 can be present but if it is not being converted to T3 there is no active ingredient for the body to utilize. As someone who has taken both types of thyroid hormone replacement, synthetic and several brands of natural dessicated glandular, I speak from personal experience that the glandular product works best for me. Again, I’m stunned this got past fact checking at GH. It makes me very sad to see an article written with such a lack of compassion and understanding. All of the false information aside, it is imporant to give women suffering with thyroid disfunction of any kind hope, strength, and understanding and the real message should be to become empowered about our health and an advocate for our own treatment and ultimately an informed confident proactive woman. Not all medication, treatment or lab tests solve all problems. Lots of woman put up with symptoms and issues that they don’t have to because one tells them it’s nothing or they don’t know what they are talking about but the truth is everyone is different and not one single treatment works for everyone. If you looks at any other sickness there is not a single line treatment. There are many options. Why would thyroid disfunction be any different? It’s importand to not exclude treatment options when trying to find a balance. I have suffered for years with hasimotos I am still not 100% but I am never going to give up because I still have hope. I read this article with shock and dismay. I am a victim of incompetant doctors who took out my thyroid, when they saw that I had an enlarged inflamed thyroid caused by hashimoto’s. They found this while doing a parathyroidectomy. They lied to me and told me that one little 100 mc t4 only pill would work for me. Turns out that t4 only meds for me do not convert to t3. T3 controls your body heat, panic attacks, metabolism, etc etc. From taking the t4 only medicine and developing extreme reverse t3, I blew out my adrenal glands. In one week I gained 13 pounds, my body temperture dropped to 94.6. My regular medical doctor couldnt believe that I was wearing a sweatshirt during a 100 degree 100 percent humidity heatwave. My hair was falling out in clumps and I was sleeping 15 hours a day, only having enough energy to get to work. I became afraid to drive my car on the highway, I threatened people that I was going to kill them and I meant it. I couldnt remember how old I was or how to spell simple words. At work I would go to the coffee machine to mail a letter. It sounds funny buts it is not. My cholesterol shot through the roof as did my sugar levels. My heart rate went to 113 at resting.. I found a website that LITERALLY SAVED MY LIFE with the information they offered. STOPTHETHYROIDMADNESS.COM, gave me options. I became educated on my condition, because apparently doctors are not. My supposedly educated endorinologist told me to go on weight watchers and that my levels are fine. Fine for who? Obviously not me. In taking the knowledge that I have found, I am not 100 percent better, but I am 100 percent better then what I was. I lost over 40 lbs. My body temperature is back to normal. My adrenals are almost healed. My hair no longer falls out, I no longer have back pain, I can drive again and I am no longer angry. My memory has come back and I can stay awake and get things accomplished. I don’t know what kind of reporter you are, but listening to one doctor, and searching out websites is not what I call informed reporting. Did you reach out to any one person that was a part of these forums to ask them about their experience. If you did a little more research you would know that Armour was the drug that actually worked for thyroid patients prior to synthroid being invented. It does not cause edema, bone loss, or fibromyalgia like synthroid does. You had a chance to help millions of people with your reporting, but what you did was dismiss us and I feel sorry for you, because you will realize what we are all going through because of the NON-treatment you are receiving.